This is a review of a book bringing to light a collection of about 1300 Islamic scientific manuscripts on astronomy and various scientific topics in three languages (Turkish, Arabic and Persian). These manuscripts are held in the Library of Kandilli Observatory and Earthquake Research Institute at Bogaziçi University in Istanbul. Figure 1: Cover page of the book. 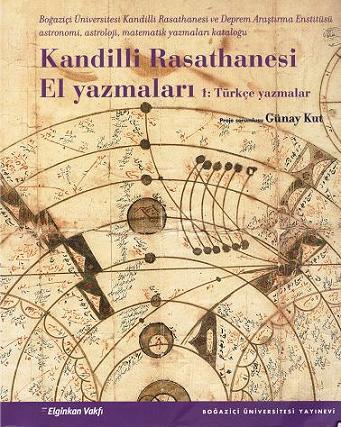 Review of: Manuscripts of Kandilli Observatory. Kandilli Rasathanesi el yazmalari 1: Türkce yazmalar. Project manager Gunay Kut; prepared by Hatice Aynur, Cumhure Ucer, Fatma Buyukkarci Yilmaz. Istanbul: Bogaziçi University Publication, First edition, 2007. 579 pages, 22 x 24 cm. ISBN 9756193646. This is a review of a book bringing notice of a collection containing 1340 Islamic scientific manuscripts in three languages (Turkish, Arabic and Persian) held in the Library of Kandilli Observatory and Earthquake Research Institute at Bogaziçi University in Istanbul. This catalogue was published in cooperation with UNESCO, whose contribution covered the preparation and publication of the catalogue of these manuscripts, maintenance of the catalogue in a computer-readable form and the production of a CD-ROM consisting of the catalogue and sample pages from most of the manuscripts. Figure 2: Gurranamas, Rûznama and Jadawil-i sinin samples from the Kandilli Library. The Kandilli Observatory and Earthquake Research Institute (KOERI) is Turkey's unique organization encompassing earthquake observation, research, education and application services into one integrated body. Established in 1868 as the Imperial Meteorological Observatory, Kandilli Observatory extended its activities in the 20th century into various observational fields such as astronomy, astrophysics, geophysics, geomagnetism, seismology, time service observatory and solar physics. In 1982 Kandilli Observatory was joined to Bogaziçi University. A new Earthquake Research Institute was founded to merge with the Observatory. The new body, named KOERI, was reorganized with the main emphasis oriented towards earthquake research, education and relevant service activities. The Observatory is located in a large and independent campus on the beautiful hills of the Bosphorus just across the campus of the Bogaziçi University. The catalogue contains a very precious manuscript collection which is largely concentrated on the astronomy and astrology works. It also includes other scientific works of the periods between the 11th and 20th centuries related to mathematics, geography and other scientific topics. The creation of this original and unique special collection was undertaken long ago by Mehmed Fatin Gökmen, the founder and the first manager of Kandilli Observatory. The collection is also registered at the World Memory Program, which is initiated by UNESCO with the aim to establish a worldwide documentary basis for the world's intellectual heritage. 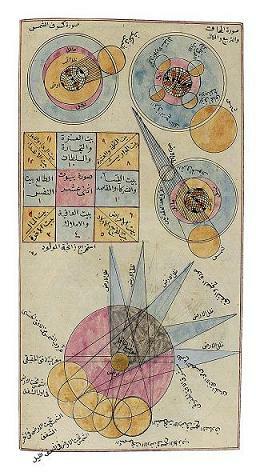 Figure 3: Majmua-i Hay'a, unknown author. The Kibla-nûma figures show how to find the direction of the holy Ka'ba (Kandilli Library, MS 198/1, fol. 35b-36a). The catalogue published this year mentions a total of 1340 manuscripts (845 in Turkish, 395 in Arabic, 100 in Persian). The classification of these manuscripts according to subject yields the following distribution: 887 in astronomy, 277 in astrology, 81 in mathematics, 18 in geography, and 75 in various other subjects. Figure 4: Omar Ispirî's Rûz-nâma-i dawr-i dâ'im, written in 1765-7 (Kandilli Library, MS 101). Headed by Professor Günay Kut, the Head of the Turkish Language and Literature Department at Bogaziçi University, the project aimed from 1994 to publish all the necessary information on the manuscripts, including their context and the period in which they belong, together with colourful reproductions of some of their pages. The project was completed in 1995, but the catalogue had to wait 12 years before being published due to a lack of funding. The present version is in Turkish, but there are also plans to publish an English version of the catalogue in the future as well. The manuscripts, written by prominent scientists of their respective periods, give information on various topics including general astronomy, arithmetic, animals, latitudes and longitudes along with calendars. Some of the manuscripts carry the signet of the period's Sultan. The catalogue provides very detailed information about the manuscripts, such as title, author, data on the copying, written date, besides the usual incipit and excipits (the last and the first paragraphs of the individual manuscripts). In the beginning, a detailed guide shows to the reader how he should proceed in the use of the catalogue. Ahqam-i Nucûm (Kandilli Library, MS 64/6, p. 310). The oldest Turkish work in the collection is the Risâle-i si fasl that belongs to the first half of the 15th century. The oldest Arabic work dates back to year 1025 and the oldest Persian work dates back to year 1461. The space spared for calendars in the catalogue is quite large. This section includes all the works related to time determination. The oldest calendar in the collection is a Persian calendar which was prepared in 1490-91 for Sultan Beyazit II. Under the astronomy yearbooks title in the catalogue, there are the schedules indicating the positions of a specific celestial body throughout the year. 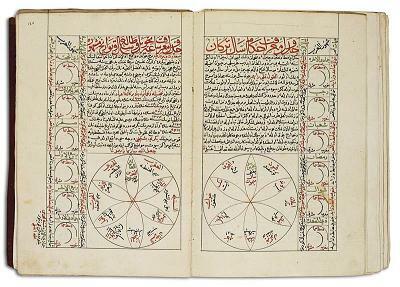 Among the important works included in the collection are the "Marifetname" of Ibrahim Hakki of Erzurum belonging to the 18th century, which contains a wealth of information about scientific life in the Ottoman Empire, such as the astronomical observations made by Ali Kusçu, and also calendars and astronomical studies by famous mathematicians such as Ulugh Bey and Taqi al-Din. The first observatory in the Ottoman world was the Istanbul Observatory set up by Taqi al-Din in the late 16th century. Founded at the behest of Murad III, it was razed again on the sultan's command. The second observatory, the Imperial Observatory, which started out in an apartment building on Istiklal Avenue in 1868, met the same fate as the first observatory when it was destroyed in the uprising of 31 March 1909. The new government formed after the rising appointed Fatin Gökmen (1878-1955) director of the Imperial Observatory and charged him with finding a location for the new building. Gökmen decided on Icadiye Hill on the Bosphorus at Kandilli, where the present observatory still stands, and work commenced there in 1911. When the offices of chief astronomer and mosque timekeeper were abolished in 1926, the observatory took over the task of calculating the Islamic calendar. Attached to Bogaziçi University in 1982, the observatory was renamed the Kandilli Observatory and Earthquake Research Institute. During his term as director, Gökmen amassed a wealth of documents relating to the history of astronomy, mathematics and geography as well as manuscripts - either originals or translations, or compiled by the chief astronomer of their time - and left behind a valuable collection. It is this collection that was compiled in the catalogue published by the Bogaziçi University. 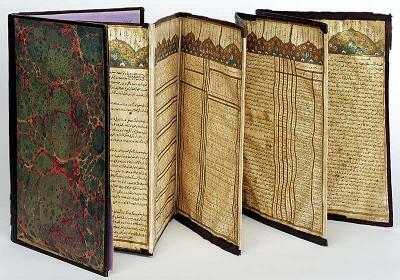 The oldest of the Ottoman State calendars among these manuscripts dates to 1444. Such calendars were drawn up every year in two parts, the annual calendar (takvim-i sal) starting from Nevruz (the first day of the year) and the calendar of predictions (ahkâm-i sal). It is thought that these calendars were in the beginning put together by astronomers outside the palace and then submitted to it. Then, beginning in the 16th century, calendars were compiled by the chief astronomer, an official employee of the Ottoman State, and presented to the palace, where they were checked by the Sultan himself and the grand vizier. The first part of these generally two-part calendars included historical and astronomical information. The earliest calendars, for example, contain chronological lists of the prophets and their successors going back to Adam, as well as the Seljuk, Karamanid and Ottoman rulers, historical information, astronomical and astrological calculations. These were followed by ‘signs' relating the month of the year and the day of the month; predictions based on the Sun, Moon, stars and seasons, interpretations of dreams, and even lists of foods and beverages appropriate to the different times of the year. The second part was the actual calendar, which generally took the form of fourteen page tables. Figure 7: Darwish Muhammad Al-Hasib Al-Mawlavî, Taqvîm-i Sâl: 1134-1135 H (1722-23 CE) (Kandilli Library, MS 540). This figure shows the planets, signs of zodiac and months in the semi circle. Top left of the figure also contains a Gurrenâme (first dates of the months). The circle at the right top of the figure shows climates, signs and winds. The publication of the catalogue of this unique collection of astronomical manuscripts, including some rare and unique specimens and some very old dated manuscript copies, will certainly shed new light on the scientific production in the Islamic world in the Ottoman period.